The saga of John Kennedy Toole is one of the greatest stories of American literary history. After writing A Confederacy of Dunces, Toole corresponded with Robert Gottlieb of Simon & Schuster for two years. Exhausted from Gottlieb’s suggested revisions, Toole declared the publication of the manuscript hopeless and stored it in a box. Years later he suffered a mental breakdown, took a two-month journey across the United States, and finally committed suicide on an inconspicuous road outside of Biloxi. Following the funeral, Toole’s mother discovered the manuscript. After many rejections, she cornered Walker Percy, who found it a brilliant novel and spearheaded its publication. 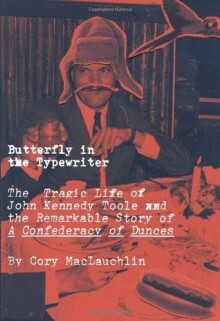 In 1981, twelve years after the author’s death, A Confederacy of Dunces won the Pulitzer Prize.In Butterfly in the Typewriter, Cory MacLauchlin draws on scores of new interviews with friends, family, and colleagues as well as full access to the extensive Toole archive at Tulane University, capturing his upbringing in New Orleans, his years in New York City, his frenzy of writing in Puerto Rico, his return to his beloved city, and his descent into paranoia and depression.